At Avant LASIK Spa, we are committed to delivering a superior laser eye surgery experience. This is why we created Avant Signature Care—a new approach to the LASIK process focused on the needs of you, our patient. By reexamining everything about the LASIK surgery process, we are transforming the way Massachusetts views LASIK. The clinical and impersonal atmosphere of the standard doctor’s office has been replaced with a soothing and inviting setting more reminiscent of a relaxing spa. 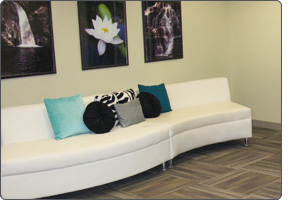 You’ll notice unexpected touches like leather recliners and plush couches in our waiting and recovery lounges, our laser suite, which is temperature and humidity controlled, and even post-procedure gift bags that include a little thank you for the person who drove you. Unlike most LASIK centers, it is our policy to be up front and honest in our pricing and our results. And every step of the process has been elevated to provide greater personal attention, including your own personal LASIK counselor who will be there for you every step of the way. Learn about our entire process from start to finish – from your first visit to the day of your eye surgery. Avant Signature Care, only available through Avant LASIK Spa in Boston, is a better experience in better vision. Avant LASIK Spa has developed an open-access policy allowing outside ophthalmologists to perform surgeries within our surgery center. If you are a refractive surgeon interested in using this option, please contact our Center Director at 781-281-7950. © Copyright 2016 Avant Lasik Spa. All rights reserved.